I guess it happens quite frequently: you have already checked in, and at the security check you realize that you have in your backpack your grandmother's Klingon bat'leth blade, an item that has been in your family for generations and that you absolutely do not want to throw away. What are your possibilities at this point? What do you do with a forbidden item with which you cannot fly, and which you do not want to throw away?, The airline company will probably offer to send it as a stored luggage, but that may be inconvenient (because of the price, or because the item is too fragile, too large, or too small). Are there other possibilities? An option could be shipping it, but I have never seen a courier or a post office in an airport. I have never looked for one, actually, but if there are any they are not well advertised (unlike every other store in an airport), and I assume that they are not open at all the times of the day when an airport is operational. Are there any other possibilities? Post it to whatever address I wanted it - in Heathrow airport, there is a post office, although not in every terminal. I could put the item in a separate bag/whatever and check it in. If I didn't have a bag to put it into, there are plenty of shops landside that sell luggage (various bags, suitcases, etc.) - I could purchase the right size bag there, put the item in it and go back to the airline counter to check it in. Depending on the airline and how many bags with how much weight you have already checked in, they may charge you for this additional one. Refuse to fly - my checked in luggage would be returned to me, but I would forfeit the ticket. The main point to keep in mind is that you're still landside. Depending on how much time you have left before your flight, you could even go back home, leave the item there and come back to the airport. For example, if you're in Heathrow and live somewhere near Paddington, you can easily get from the terminal to home and back to the terminal in under an hour. That said, your options may be very much limited by what airport you are in. If everything else fails and the item is REALLY, REALLY priceless, you can always turn around, go to the airline desk and tell them that you changed your mind and don't want to fly. They will then return you your checked in luggage. You pack your item there, then buy another ticket. Prepare to be quizzed by some men in black though :) "Changing your mind" after having checked in is considered a very suspicious move. P.S. The item that happened to be in my backpack was an 8mm drill bit for glass and tiles, which I lent to a colleague, then he returned it, I put it in a small outside pocket on the backpack - and completely forgot about it. I flew with this backpack almost 3 months later - and ended up throwing the bit away, as buying a new one was the cheapest option. Take the item to the ticket counter and check it in your baggage or a box provided by the airport. Many airports have a US Postal Service or other shipping services area where boxes, stamps and envelopes can be bought so you can ship your items home. If there is somebody seeing you off, you can hand the prohibited item to them. If your car is parked outside, you can take the item to your car. This option is probably not available everywhere (but it's available in terminals 2, 3, 4 and 5 at Heathrow), it only works if you'll be back to the same airport at some point, and the cost may be a tad high if you'll be away for while (but probably cheaper than the fees for an extra checked bag): just leave the item as left luggage! The company managing this at Heathrow can also (supposedly) wrap, ship, deliver items, and they sell accessories. Not sure how prevalent this is in other airports, but I'm pretty sure most major airport will have similar services. Something like this happened to me some years ago. I was flying from Sydney, Australia to Bali, Indonesia with China Airways - I think!? There was a final hand-luggage check at the departure gate. I was "randomly" picked and my bag was checked. 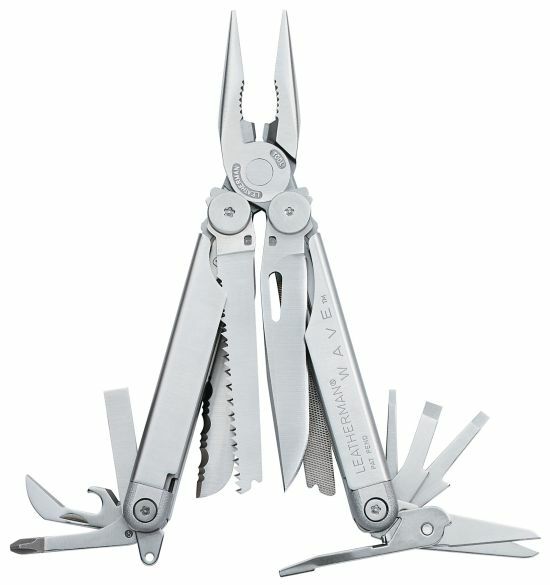 Unfortunately, I'd completely forgotten that my Leatherman Wave was in my hand luggage! Apart from the initial shock of the security guard finding the above item, I was rather surprised that it hadn't been found earlier going through X-Ray. My hand luggage was basically my day bag that I'd been carrying around for weeks (I was backpacking). Anyway, they were great about it. They gave me a "receipt" and the item travelled separately. I then picked it up from the "confiscated items" counter when I got to my destination. No additional cost, no time wasted. I think I was lucky! I once realized I had my pocket knife with me and I was not checking any bags. I went outside and buried it in the dirt. A week later when I came back, I dug it back up. The time I made this mistake with a multi-tool in Toyama (around 2007 I think), I simply (and even with my limited Japanese it was simple) brought the situation to the attention of the checkpoint workers, who handed me a plastic bag with a form on it to fill out, stuck the article in the completed form-bag, tore the receipt off the top and handed it to me, and made the tool disappear into the bowels of the airport. After we landed at Haneda, I went down to baggage claim where I found the "forbidden articles" desk (conveniently labeled in Kanji, Romanji and English). The only snag was that the man who was tasked with helping passengers get their bags off the carousel was also the person working the desk. So I had to wait until all the luggage was removed from the carousel before I could recover my tool. That last bit feels like a Japanese solution to me and I wouldn't be surprised to learn that it was done that way on purpose. In San Francisco (and probably other airports?) there are small self-serve dropboxes, next to the line to go through security. You can take an envelope from the supply on top, fill it out, including writing your credit card number down, and they will ship the contents to you for about $20. I did this a few years ago, when I forgot to leave my pocketknife at home. I felt like a chump paying the $20, but since the knife would cost me $30 to replace, I did it. About a week after I returned home, the package arrived. I would ask someone that is not going to fly to keep the item safe until my return, and offer money in order to do so. Even though you are asking a favor to a random stranger, this is not as awkward as it sounds. And there are plenty of options you could choose. This would work better if the person in question lives in the same city as you, but it really depends on the circumstances. In most of the Europe, if you are found with prohibited items you are given a chance to go back to the Airline counter and arrange a checked in service (maybe meaning that you'll have to buy a bag to put it in). I have indeed seen counters that will pack and ship for you, at some expense. I believe I saw that in Zurich and London, but memory is foggy. I've also noticed long after that something prohibited went through without getting caught, which can be annoying in a difficult-to-describe way. Same thing happened to me at Schiphol with a rather expensive Leatherman Tool. Went back out, down to the newspaper stand and brought a boatload of postage stamps. They were even kind enough to give me a free envelope (otherwise I was going to wrap it in a sheet of paper). Dropped it in the mailbox and went back, took perhaps 15 minutes in all. Needless to say a very strange letter but was lying in the mailbox when I got back. Not the answer you're looking for? Browse other questions tagged air-travel airport-security hand-luggage shipping or ask your own question. Peacock feather a prohibited item? What to do with hand luggage in airports? How to secure a roll-top closure bag?